Remember to hike single-file when with a group. Common sense seems like a typical response to how to behave on the trail, but you’d be surprised how many have no clue. My friends over at Modern Hiker kindly put together a few tips that everyone should consider while adventuring outdoors. Hikers going uphill have the right of way. This is because hikers heading up an incline often have a smaller field of vision and may also be in that “hiking rhythm” zone and not in the mood to break their pace. If you’re about to pass another hiker from behind, announce your presence, even with a simple “hello”. When passing, always stay on the trail to reduce erosion. In group hiking, always hike single-file, never taking up more than half the trail space, and stay on the trail itself. Over time, those off-trail boot prints can badly erode switchbacks and destroy drainage diversions. 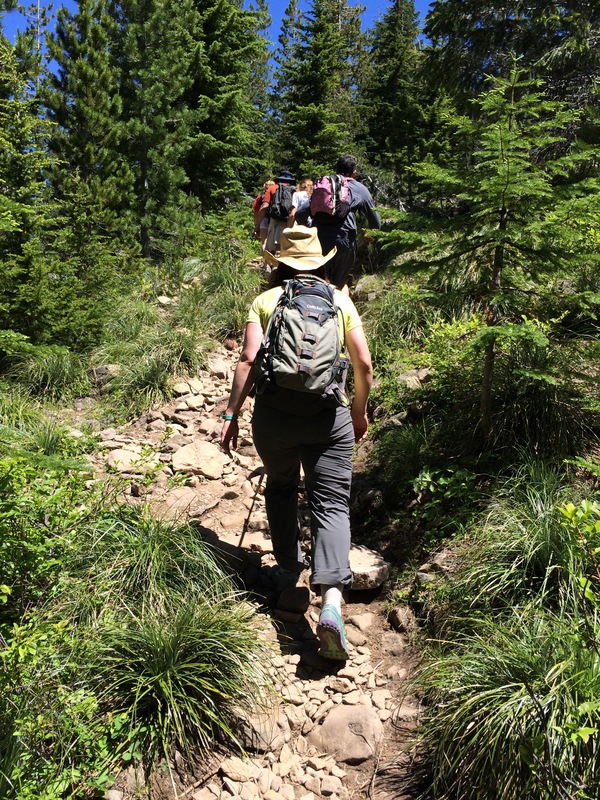 When a group meets a single hiker, it’s preferable for the single hiker to yield and step safely to the side. Bikers are generally expected to yield to hikers on the trail, though it’s usually easier for hikers to yield the right of way—especially if a mountain biker is huffing and puffing up a tough incline. Bikers should never expect a hiker to yield. Bikers should call out as they come down steep slopes or blind switchbacks, and should also let hikers know if there are other bikers following them. Hikers should also be aware of their surroundings on shared trails, particularly with mountain bikes quickly coming around any bend. I have wanted for years to see frozen waterfalls, and Portland’s early winter finally afforded me the opportunity to see some beauties. The Columbia River Gorge has over 100 waterfalls, and many of them freeze over during the cold snaps. This excursion takes us to the E Columbia River Historic Highway to view Horsetail Falls, Ponytail Falls, Multnomah Falls and Bridal Veil Falls. Distance and Difficulty: Total of 3 miles across all the waterfalls, with the longest stretch being 1 mile round trip. Easy. Directions: From I-84E, take exit 28 at Bridal Veil and turn right onto the Historic Highway. Drive for about 4 miles until you see the Bridal Veil parking lot. After you’ve enjoyed the Falls, head back east on the Historic Highway and stop at the various waterfalls (you’ll see them all the way down). Choose the falls I’ve noted, or go even further down toward Ainsworth to Elowah and McCord Falls, Latourell Falls, or Lancaster Falls. Tip: I strongly recommend cramp-ons for this kind of a trek. The snow is very packed, so snowshoes aren’t necessary, but regular hiking shoes don’t offer the right amount of traction. I immediately picked up a pair from REI after NOT having cramp-ons and am very excited to test them out. There’s something special about the first hike of Fall. The air is cooler, filled with the smell of retired leaves and dampness, and the multi-color visual display is heart-warming. I celebrated the new season with a simple hike to the Gorge’s Elowah Falls. This destination is a gem – far from the Multnomah Falls crowds, and simple for the whole family, no matter what age.